Good evening! School started on Monday and I'm so excited! Student Council has some great things planned, there's a pep-rally soon, we're starting figure drawing in Studio Art, in Algebra II/Trig we're doing graphing, and today was Free Dress Day. All in all, school is not too shabby. I wasn't able to take a full body picture of my outfit because there really isn't anybody to help me with that at home at the moment, so my friend Laken actually helped me out at school and took a quick snapshot (check her flickr out HERE). So, this is just a little preview of what is to come. Be excited, it's an amazing jacket that my mother and I bought in Germany a couple days before we went on the plane home. A bunch of my friends said I looked like a person who belonged in a marching band, but I would have to say this reminds me a ton more of Michael Jackson. Remember, his sequined red military jacket and sparkly glove? That's what this reminded me of, and proud of it. Now where can I find some sequined gloves to channel my inner Jackson? OH! Also, I got featured in S.A.Y.U.R.I.S. blog :D if you're curious. go look! ps. I dedicate this post to Ebony. omg this jacket seems sooo cool! i love the details on your jacket! I love this blazer :) ! Love your jacket and your picture! your jacket is amazing, can't wait to see more photos! Nice vest. Thanks for your comment. i wish i could see the full image of this jacket ! I love what I can see of the jacket, very cute. Glad that school is well so far! i love gold details combined with such fierce red ! this jacket is so amazing. The military jacket is gorgeous! Your jacket looks very nice :D! 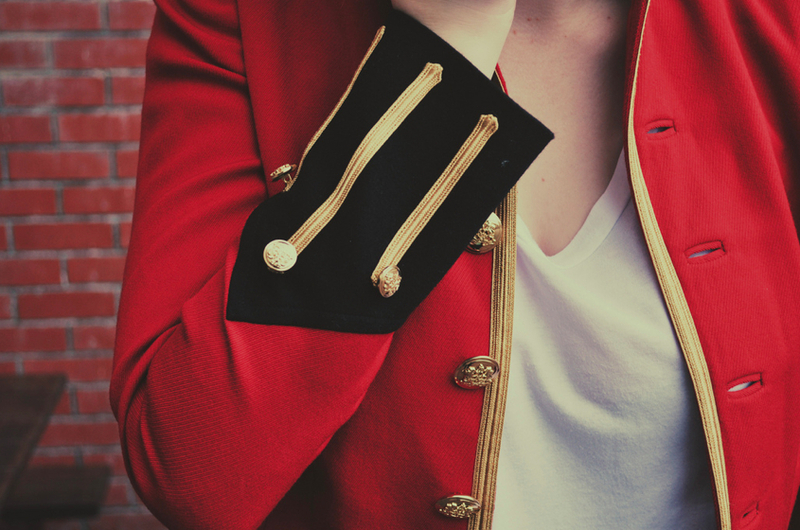 that is seriously the most amazing red jacket i've ever seen! I just stumble upon your blog and that jacket totally stood out to me. Where can I get one like it? the jacket it's so cool !